After lots of research and even more practice we are very excited to announce the launch of our new Thai Street Food venture 'Soi 38'. This Sunday 21st October we will be premiering Soi 38 at the North Melbourne Spring Fling. 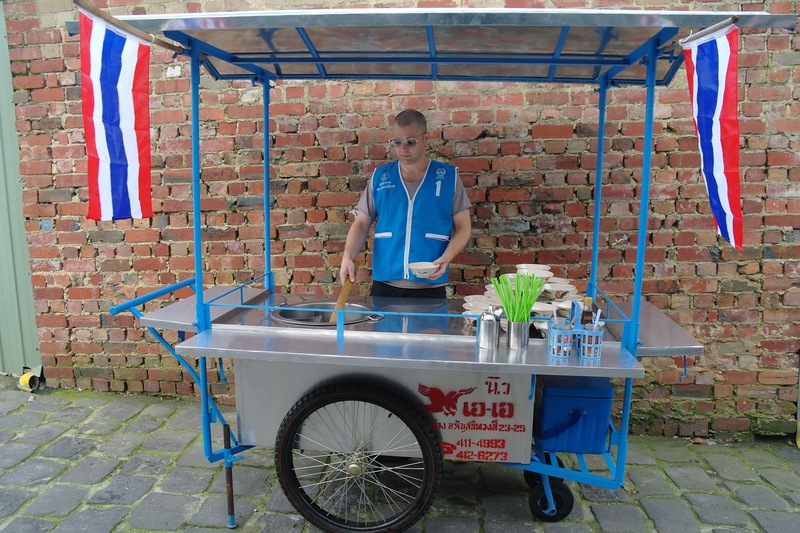 Regular readers will already be aware of my dream of launching a Thai Boat Noodle Pop Up Street Food Cart in Melbourne. It's a bit of a crazy dream but I have a passion for Thai Street Food and a passion for Melbourne so somehow in my mind it fits perfectly. 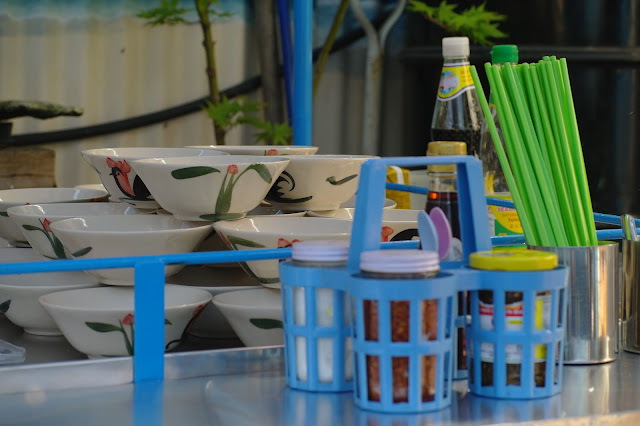 It's really all about the love of Thai Street Food and hopefully having a bit of fun (or as the Thai say sanuk). With a cart fully imported from Thailand and a recipe refined over the past 6 months the plan is to bring a little bit of Thai Street Food authenticity to Melbourne. A huge thanks goes to my good friend Khun Top from Tidlom Thai Antique for his help with the recipe and for patiently answering all of my many questions. A big part of Thai noodle soups is the seasonings - fish sauce, white sugar, crushed roasted chillies and chillies in vinegar. These are added at the customers discretion to create a personalised taste combination of the four pillars of Thai food - salty, sweet, sour and of course spicy! 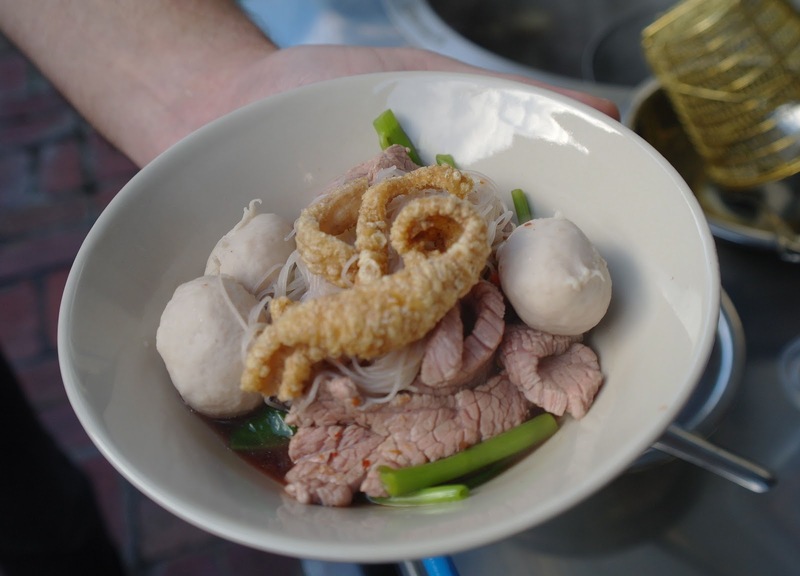 Soi 38 is synonymous with street food in Bangkok as it is one of the most famous and most popular locations where some of the best street food can be found. Soi means side street in Thai and rather than naming all the side streets off a major road they are simply numbered, hence Soi 38. At night Soi 38 literally transforms into an open air food court crowded with stalls, tables and customers while at the same time the street is still open to cars who use it as a kind of drive through as they order take away through their car windows. Eating Thai soup noodles is a little bit of a skill, albeit one that is quite easily obtained. Unlike many of their South East Asian neighbours the Thai don't use chopsticks on a regular basis. Chopsticks are pretty much reserved for eating soup noodles. The method is to use the chopsticks in the right hand to pluck out some noodles and other special bits while simultaneously using a spoon in the left hand held just under the chopsticks to ensure that the mouthful of noodles is quickly followed by a slurp of the delicious broth. 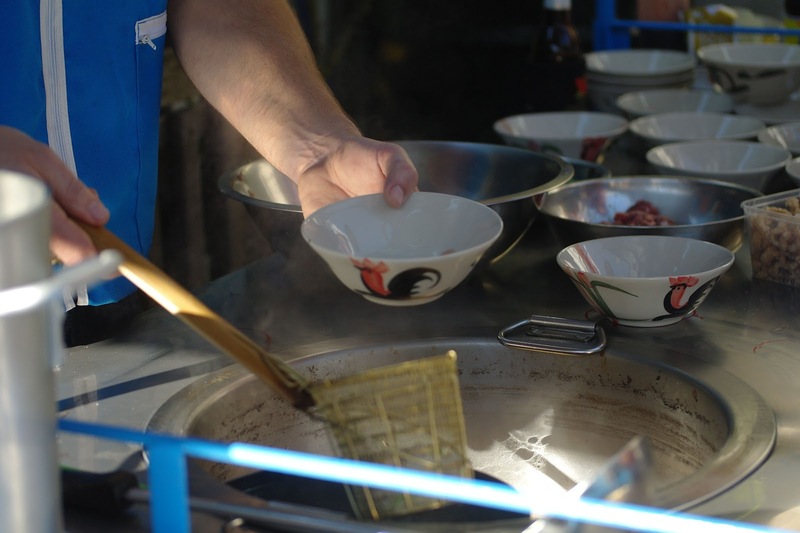 So if you have an interest in Thai food (which I assume you do as you are reading this blog) do yourself a favour and get down to Errol Street this Sunday and try what I hope will be some of the best soup noodles you've ever tasted! In my opinion Boat Noodles leave Vietnamese Pho in their wake. Unfortunately Boat Noodles are just not very well known in Australia, it is my hope that Soi 38 will be one of the first small steps in changing that. 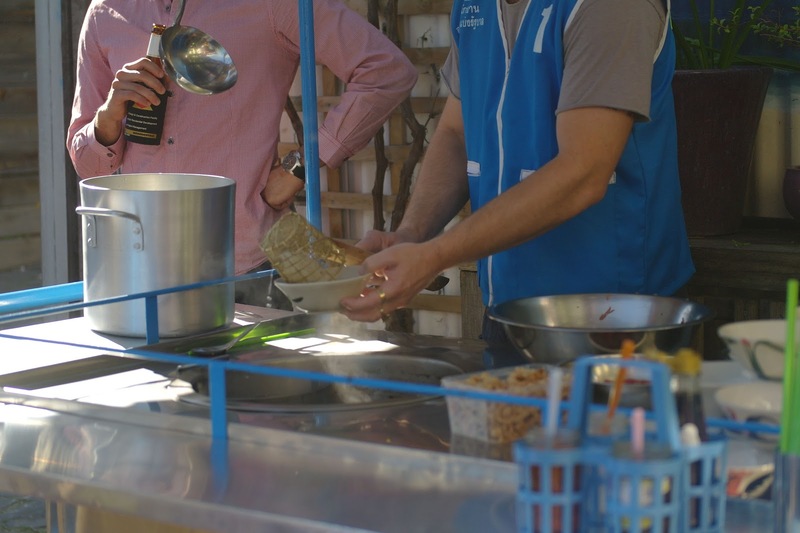 After slurping up a few bowls of boat noodles and rubbing your very satisfied tummies - roll on over to the smaller street food cart for the final sweet touch - Khanom Dorayaki. I do believe this treat originated in Japan (with a savoury red bean filling) - but the Thai style in my opinion is far superior as it contains a variety of sweet fillings. At the Spring Fling we will be serving Custard, Pandan Custard, Sweet Taro, Sala Custard and Creaming Soda Custard Dorayaki. Our adventures with Thai food were (in the beginning) very heavy on lunch/dinner meals and light on desserts. As a huge fan of sweets this needed to be amended and slowly we happily worked our way through many Thai desserts. 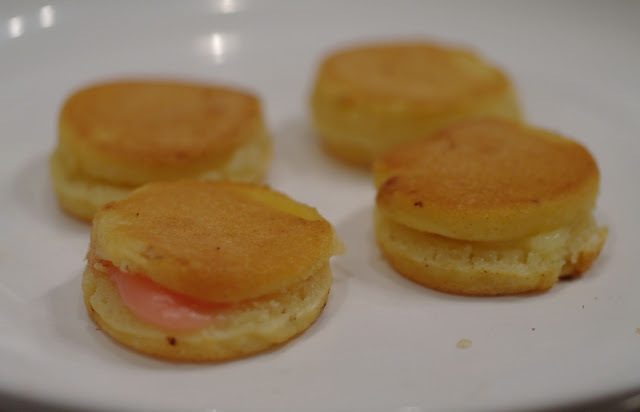 Although we have many favourites - Khanom Dorayaki is up there with the best! 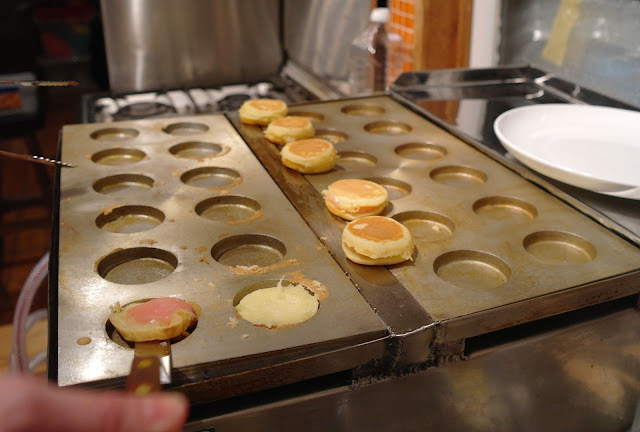 I remember our first experience with Dorayaki so clearly - we were walking along at a market in Silom and spied this lovely Thai lady making these circle shaped pancake like sandwiches. Purchased straight off the cooker we took our first bite and while the runny warm custard was dribbling down our chins we looked at each other and smiled with happiness! A year down the track we decided that this treat needed to be bought to Melbourne to serve along with Boat Noodles and after tracking down that lovely Thai lady 'Lucky' - she showed us how to cook this very delicious dessert and gave us her secret recipe. We can't wait to share these with you - I am fairly confident you won't be able to stop at one! You can read more about our Boat Noodle adventures here, here and here. And here is a little bit on Sukhumvit Soi 38. Love your post and gutted we will be in QLD this weekend when you push this idea into reality. Will ensure we are hunting you down once we return to Melbourne. A highlight of thee spring fling. Awesome noodles. Gave me the motivation to have my own stall next year! Thankyou Scott. Good Luck with the stall next year! We will definitely be going around again, we had a blast! Absolutely loved the noodles at Spring Fling! (I was the guy with the 'Thailand' touristy cowboy hat.) And your smoky green chilli condiment was also a triumph! I've been a fan of Thai street food for quite some time now - I'm just back from trying almost every stall along Soi Convent - and it was so exciting and heart-warming to see your cart in cold old Melbourne. What's more, in my humble opinion, your noodles were as good or better an example as any I've had in Thailand and a million miles better than those you'll find in the majority of local Thai restaurants: the bassnotes in the broth, the sweet anise-tinged aroma, the tender beef and the overall judicious restraint and authenticity in pulling it all together were truly inspired! Also, Tina's khanom dorayahi were sensational! (My wife was extremely upset to discover I'd eaten them all on the way home.) I understand it's been a long and passionate journey and I'd like to say that from my selfish perspective as a consumer, it's certainly been worth it. I pray that this adventurous city is ready to become addicted to Thai boat noodles and pandan delights and we soon find your carts on every street corner. The best of luck to you both! Ah Soi Cowboy man! My favourite customer of the day! Thankyou for your enthusiasm and very kind feedback, it really means a lot to us. I am especially thankful of your praise for my broth, it's been a long work in progress and it's great to hear that the work is appreciated! We really have no plans as to what next but we had such a good time we have all decided we need to do it again soon. Rest assured that when we work out what's happening next you wil be the first to know. When can you pack up the trailer and come to Sydney?